People are an organisation’s most important assets. The tasks of a manager are essentially people-oriented. Unless there is some understanding of people, management will be unsuccessful. 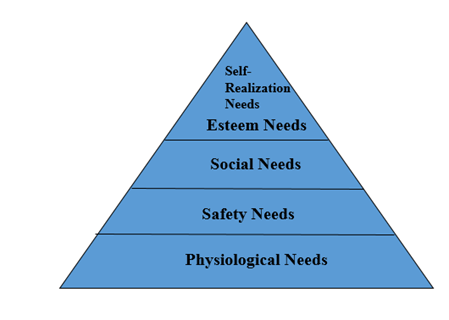 Poor people management is an important contributor to project failure. Team members should all be treated in a comparable way without favourites or discrimination. Different team members have different skills and these differences should be respected. Involve all team members and make sure that people’s views are considered. You should always be honest about what is going well and what is going badly in a project. An important project management task is defining the team requirements for your project and selecting your team. For a project to develop a successful system, the developers must understand the application domain. It is essential that some members of a development team have some domain experience. This may be significant if low-level programming is involved. Otherwise, not usually a critical attribute. This is normally only significant for short duration projects where there is not enough time to learn a new language. While learning a language itself is not difficult, it takes several months to become proficient in using the associated libraries and components. This is very important for software engineers who constantly have to solve technical problems. However, it is almost impossible to judge without knowing the work of the potential team member. This may provide an indicator of the basic fundamentals that the candidate should know and of their ability to learn. This factor becomes increasingly irrelevant as engineers gain experience across a range of projects. This is important because of the need for project staff to communicate orally and in writing with other engineers, managers and customers. Adaptability may be judged by looking at the different types of experience that candidates have had. This is an important attribute as it indicates an ability to learn. Project staff should have a positive attitude to their work and should be willing to learn new skills. This is an important attribute but often very difficult to assess. This is an important attribute but difficult to assess. Candidates must be reasonably compatible with other team members. No particular type of personality is more or less suited to software engineering. An important role of a manager is to motivate the people working on a project. Privacy - each engineer requires an area for uninterrupted work. Outside awareness - people prefer to work in natural light. Personalization - individuals adopt different working practices and like to organize their environment in different ways. Providing individual offices for staff has been shown to increase productivity. However, teams working together also require spaces where formal and informal meetings can be held. The People Capability Maturity Model (CMM) is a tool that helps you successfully address the critical people issues in your organization. 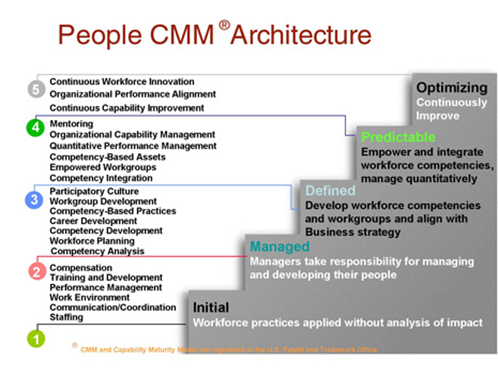 The People CMM employs the process maturity framework of the highly successful Capability Maturity Model for Software (SW-CMM) as a foundation for a model of best practices for managing and developing an organization's workforce. The Software CMM has been used by software organizations around the world for guiding dramatic improvements in their ability to improve productivity and quality, reduce costs and time to market, and increase customer satisfaction. To improve organisational capability by improving workforce capability. To ensure that software development capability is not reliant on a small number of individuals. To align the motivation of individuals with that of the organisation.